Rabbits: Get rid of your rabbit problem and protect your property for the future. Their cute and cuddly appearance mean that rabbits are often a problem left to escalate, especially in domestic settings. Rabbits though, are rapidly reproducing animals and if ignored for too long will cause expensive damage to your property. This article describes typical tell-tale signs that would indicate that you have a rabbit problem, pointing out the damaging impact that they could have and several methods for taking back control. Rabbits: What signs should I look out for? Apart from spotting the pesky cottontails in action, how else can you tell that rabbits are causing the damage on your property? 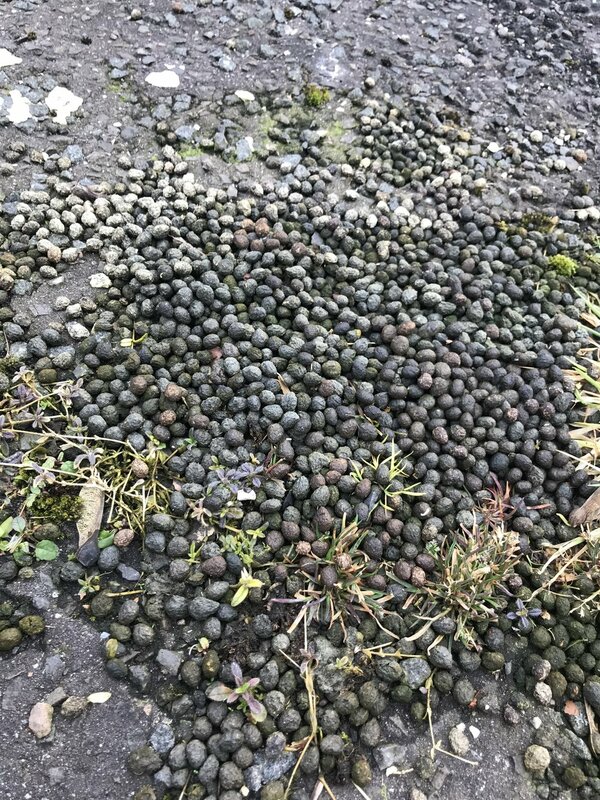 Droppings, you will usually find small piles of round, brown droppings, about 1cm in size. Typically they have a sawdust texture to them, this is because of them favouring tree bark in their diet. If you find tubular shaped droppings, they are more likely to be from a rodent. Stripped tree trunks, rabbits like to gnaw on tree trunks stripping it of it’s protective layer. Rabbit burrows, usually around 10-15cm in diameter. You will tend to find them on slopes and banks, with their burrow leading to an extensive network underground. Rabbit droppings, and fur at the entrance are also a good indicator for identifying your pest issue. Rabbits: What damage can they cause? Rabbits are a huge issue for farmers and require constant control measures to ensure populations don’t get out of hand. Seven rabbits can eat as much as a sheep and with their reputation for rapid reproduction you can see why it wouldn’t take long them to make a huge impact on a farmers crop yield. When out for walks yourself you’ll have no doubt stumbled at some point over a rabbit hole. For farmers who have livestock or people who keep horses; vets bills can soon add up, whether it’s helping to repair an injury or worse still put them to sleep. Recently we have been called to help out at a lot of forestry plantations, due to rabbits taking hold. Rabbits will strip trees of their bark, removing a protective layer, which allows fungi and bacteria to grow killing the trees due to their lack of nutrition. With younger plantations, a large rabbit population can kill off hectares of saplings within a relatively short space of time. Meaning that the landowners investment is wasted and any forecasted revenue wiped out. Blooming gardens awash with colour are the prime target of many a rabbit, as they choose to de-head flowers and consume plant shoots, taking them right back down to floor level. They can destroy a garden within days, reducing your summer backdrop to a deserted soil ground. Rabbit droppings and urine will leave scorch marks on previously lush green lawns and their burrows will create a pot hole appearance. They are the nemesis of many a sporting ground as they can cover vast areas undisturbed and are difficult to control with general public interaction. As well as the unsightly appearance of rabbit warrens, the big worry for landowners is the health & safety impact on their business, with the fear over injured parties making claims. If a burrow system is left to progress over time, the ground supporting it will collapse. This is particularly hazardous near roads, railways and buildings, as it will undermine their structural support. Rabbits: What is the best way to treat my problem? The best treatment depends on the environment, time of year and level of infestation. In locations such as golf courses, forestry areas it may take several treatments to bring the population under control or even better eradicate it completely. Gassing and shooting are the most common ways of treatment in an extensive location. Gasing is now regarded as the most effective method of control when the burrow system is accessible. We use Phostoxin, but Talunex is also available to trained pest control professionals. Rabbits must be below ground before the gassing and every warren entrance needs to be treated. The gas reacts with the moisture below ground and makes its intended impact on the rabbit population. Before undertaking this method it is important to check for the presence of other non-impact species in particular badgers and foxes. Often regarded as a recreational method of rabbit control, it is best carried out under darkness with the use of a spotlight. Why use a pest controller when you could let someone shoot on your ground for free? Simple, your hobby shooter is not incentivised to get rid of the problem. In fact, they may purposely not control the problem as well as they could, so as to guarantee return visits. On the other hand your pest controller wants to provide you with results. Shooting is great for maintaining control once a population has been reduced to a manageable level. We often use ferrets in combination with shooting in order to drive the rabbits from their burrows. In large areas it is unrealistic to think you can eradicate the problem altogether because rabbits will continue to multiply and replenish numbers, it is more realistic to control the population growth. Baited live traps are ideal for smaller areas, or places where rabbits are gaining access from surrounding terrain. If you are going to use this method, the rabbit traps need to be positioned in high traffic areas; think about sheltered spots, long grass, bushes and fence lines. You'll then need to to use some bait to entice them in, root vegetables or lettuce leaves are perfect. Once the rabbit have been successfully removed, preventative steps should be taken to stop them gaining access again, see below for more details. Please note: these traps need to be checked regularly to stop the animals getting distressed. Rabbits: What can I do to stop issues in the future? Place wire mesh cylinders around young trees or plants to prevent access until they get past their vulnerable age. They will need to be at least 50cm high, stand one or two inches out from the sapling and be buried into the ground to stop them getting underneath. Rabbits don’t like to feel exposed, so sweep up areas of leaves and rubbish that they could use as shelter. Get a boundary in position by erecting a 4ft wire mesh fence, again you’ll need to bury this under the ground by about 5 inches. Could be costly though for farms. There is talk of repellents but, if your plants are to be consumed; ie: strawberries, or carrots avoid this method as risk to health is too great. Farmers may choose to invest in electronic fences, but probably only worthwhile for high value crops. Some say that lavender and beans are rabbit repellants, not tried them myself but worth a shot! How have rabbits damaged your property? What preventative methods have worked for you ?